I wondered how long it would take. 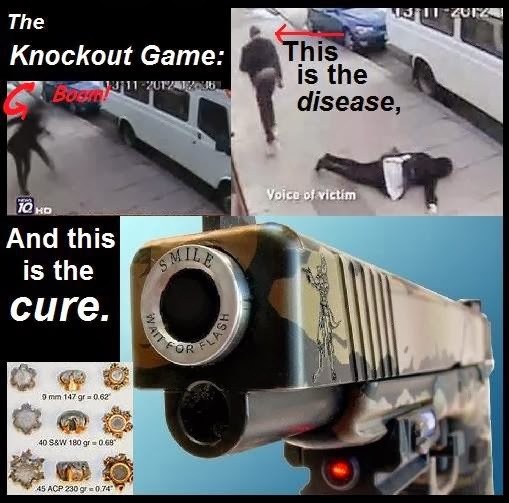 People aren't going to take this "knockout game" junk anymore. How awesome is Matt Bracken? UPDATE: Okay, maybe the Beulah Montgomery story was a hoax. But there are citizens who have fought back against 'knockout game' punks and won. Don't kid yourselves. Were American whites ever to conclude that inter-racial peace is impossible, within two years there wouldn't be a black man left alive and free anywhere in this country. We're a numerical majority. We control the preponderance of the land, the wealth, and most important, the weapons. Our targets would wear their affiliation in their flesh. It hasn't happened -- and please God, may it never happen -- because we still believe, despite many disappointments, that inter-racial amity is achievable. Preserving that conviction is the one and only hope American blacks have for their futures, and for those of their children. What would undermine that conviction? A groundswell of conviction that such evidence exists, but that our news organs have conspired to deny it to us. I pray to God that more Americans wake up and arm themselves, and stay aware when they are out in public, and fight back against this sick 'game' and other criminal schemes. And I pray that black youth get the clue that this is not acceptable behavior. UPDATE: More on the 'knockout game' at Sipsey Street Irregulars.